This completely rebuilt 150-ton Bliss straightside now boasts a new nerve center: an OmniLink 5000 press and automation controller, selected to support numerous press-line inputs and outputs to optimize quick-setup and mistake-proofing efforts. No one yelled, “Move that bus,” like Ty Pennington of Extreme Makeover: Home Edition regularly does. But pressroom personnel at an outdoor power-equipment OEM metalforming and fabrication plant surely celebrated when its newly made-over stamping press debuted in the summer of 2010. While Pennington and his crew work their home-make-over during a frantic week of work, this press makeover took 6 weeks to complete. The job: completely rebuild an aging 150-ton Bliss straightside mechanical press, with 36- by 60-in. bed; integrate a new servo-feed line to the press, capable of delivering 1/4-in.-thick high-strength (to 70 KSI yield strength) steel coil; and add a magnetic die-clamping system to the press. Last but not least, the press line received a new nerve center: an OmniLink 5000 press and automation controller from Link Systems, Nashville, TN, selected to support numerous press-line inputs and outputs to optimize quick-setup and mistake-proofing efforts. The factory supports the firm’s assembly plants, providing metalformed and fabricated parts and assemblies. Eight coil-fed presses and five manually fed presses occupy the plant’s pressroom, including two brand-new 600-ton presses brought in to support the company’s efforts to produce larger and more complex parts. Lately, says the plant’s value-stream manager, the plant also has been focused on supporting rapid growth of a new line of lower-volume products. A critical success factor has been becoming more lean and robust in the pressroom. For starters, lower-volume production has meant a shift in focus to setup-time reduction and quick-die change initiatives. This is what led to the Bliss press rebuild project. The parts being stamped aren’t big, but they are heavy gauge and of high strength steel. The 150-ton press rating was sufficient, but when the firm brought the work in, early in 2010, it immediately discovered that it needed a new feed line. The feed line features a roll feed with an adjustable-height mounting bracket, and motorized pass-line height adjustment; a threading table designed for 23-in. effective loop length; and a power straightener with a 15-HP AC variable-speed drive. The peeler station enables hands-free threading of the heavy-gauge high-strength coil. To minimize downtime for changeovers, the line includes a double-ended coil reel with powered holddowns and coil guides. The customer specified the line for strip 6 in. wide by 1/4 in. thick; width capacity is 20 in. As part of the pressline rebuild project, a primary focus became removing as much setup responsibility from the press operator as possible. Instead, the project team looked to automate press and feed-line changeover tasks, so that the operator need only worry about setting the die and threading the coil. 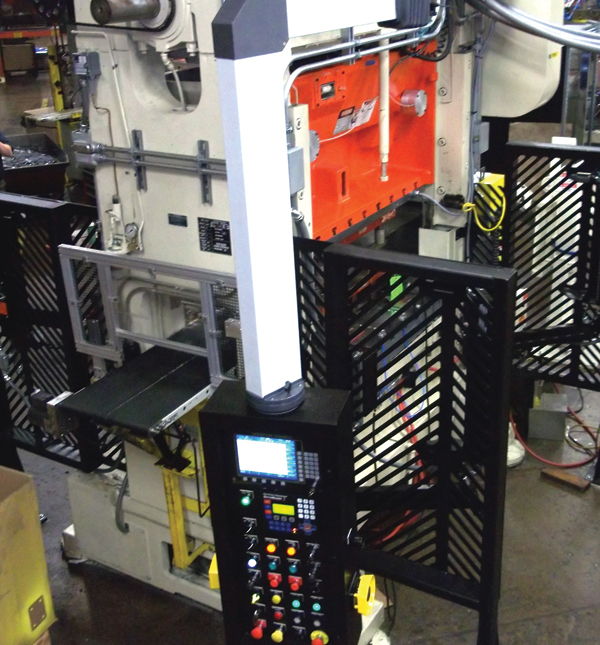 As a result, pressroom’s lean team tapped the brains of the OmniLink controller to automate setup functions, and the results are just as impressive as any home make-over you’ve watched on television. Setup time has dropped, on average, from 2 hr. to as little as 20 min., say customer representatives, resulting in a 30-percent gain in press availability. • Tasking the press control with automatically turning on auxiliary devices typically turned on and off by the operator, such as scrap systems and part-out conveyors. 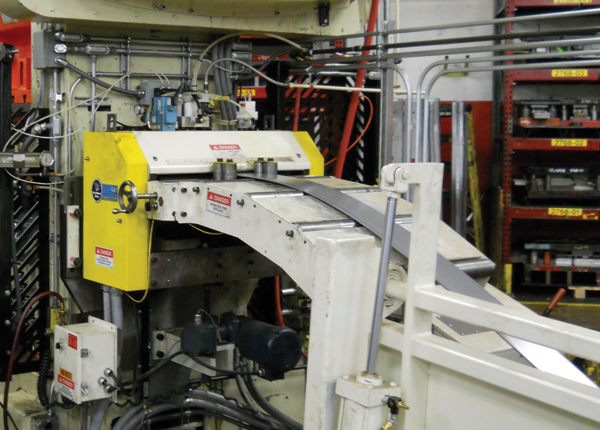 To feed thick, high-strength steel coil, the OEM pressroom added this servo-feed line to its newly refurbished press. The line handles strip 6 in. wide by ¼ in. thick; width capacity is 20 in. One of the pet peeves of the pressroom manager is part conveyors and scrap shakers, and how they seem to run all of the time. One of the areas the firm focused on, therefore, during the rebuild process was integrating conveyors and shakers into the new press control, so that they automatically turn on and off with the press—one less thing for the operator to worry about. At startup as well as during production, should the control sense five strokes of the press without a shaker cycling, it triggers a press shutdown to avoid slug buildup. About 40 percent of the rebuilt press’s run time is dedicated to the new low-volume project, running five different progressive dies, each with three to five stations. The company is changing the line over at least once per shift, sometimes two or three times per shift. An additional feature of the control that contributes to speedy, accurate changeovers: The ability to input and display plain-language notes on the control. These notes alert the operator to any special setup requirements. For example, a couple of parts stamped on the line require particularly long feed progressions—20 to 30 in. When this job runs, a note appears on the control panel to reference the unique feed-line program requires, just to warn the operator to check and make sure the proper feed program has been called up by the controller. Another enabler of mistake-proof set-ups is the controller’s ability to automate pass-line height adjustment of the feed line. The previous feeder was difficult to adjust. As a result, operators tended to use the same pass-line height regardless of the job. That led to several instances of stock buckling and other issues. The addition of magnetic die clamping to helping helped trigger a reduction in setup time from 2 hr. to as little as 20 min., resulting in a 30-percent gain in press availability. Among the OmniLink 5000 control operations selected by the OEM pressroom are 16 output channels for programmable limit switches (PLSs). These provide a variety of press-line commands, including signaling the feed when to begin during the press upstroke, signaling the feed roll to lift near bottom of stroke (to allow strip piloting), and timing of outputs to die-lubricant injectors. 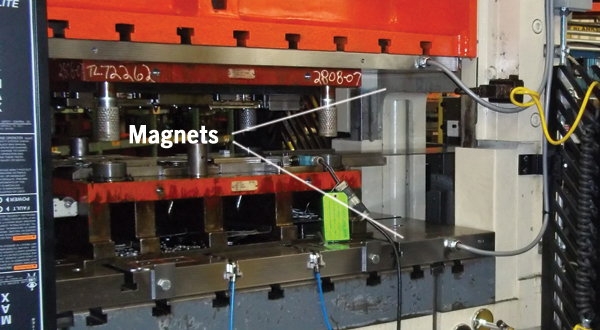 The PLSs also ensure that the magnetic die-clamping system releases the tool only when the press is near the bottom of its stroke, for safety reasons. In addition, the control boasts 16 channels of die protection. Here, operator-programmable inputs monitor a variety of sensors in the tooling as well as those used to monitor the feed line and other auxiliary equipment. End-of-stock sensors and sensors that monitor the scrap system (as previously noted) can prevent hours of downtime and crashes. Tonnage monitors mounted to the press frame gauge the tonnage being exerted on all four columns of the press, displaying the information numerically and graphically in concert with ram position. Out-of-tolerance tonnage conditions will cause the monitor to stop the press. And, the operator can review tonnage trends to prevent parts with quality issues from getting to customers, and even prevent major tooling and press damage. In some cases, they have made tooling adjustments—staggering punches, for example—to reduce tonnage and/or snapthrough forces. Editor's note: At press time, managers at the OEM described in this article asked to have the company name removed from the text. We apologize for the inconvenience.